if I were a rich man, I would hire a programmer to make 2600 and 7800 NES and SNES ports. CV and Super Mario All-Stars are at the top of my imaginary invoice. Edited by toptenmaterial, Tue Feb 8, 2011 4:48 PM. If I were a rich man, I would hire a programmer . . . 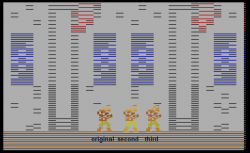 If I were a rich man, I would hire a programmer to figuratively hold my hand and teach me one-on-one how to make Atari 2600 games using assembly language. Then I could make all kinds of cool stuff to help batari Basic users. I have read most of this thread now, and will finish it after I get some rest (I'm a bit sick so reading this has made me light headed) however, I want a cart! So yeah, when it gets made (I'll take a positive approach to this and say "when" because it has to happen) I wants it!!! I wish I had this level of programming knowledge, and one day I'll stop wish and start to study. Congrats on a great looking game so far. Hello everyone, been a awhile I know. I've recently started a new lob and have gotten settled in rather well, I have a bit more free time lately so ive been able to spend more time back on this lately. I'm currently working on 2 things at the moment. I'm prototyping a text kernel for bB and getting back to my first roots of catlevania. I've made a few upgraded changes to the kernel layout and wanted to share a quick mock image. With this latest of changes, I am now going to release some working code soon to show the first level screens without the hud (as of yet). 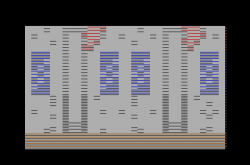 The changes proved necessary to recoup some of the RAM and seem to work out ok. Albeit the screens will now appear a bit more blocky than they were, they still have the level of detail I like and will feel right once sprites come into the mix. I hope everyone will be ok with the newer screen designs and I thank you for your patience in waiting so long for a demo bin. This will be the year for REAL progress. This image depicts the latest in a long line of kernel designs now only requires 40 bytes of RAM to render this screen or any other. I did some basic calculations and worked it out where one single bank can carry so near every single image necessary for the whole game from beginning to end. And the engine is getting closer too. The method I have followed in order to do this port is to rely on the existing game itself since it is what a good port needs to live up to. I played the damn hell out of it learning what to expect in each location just for this game port. I never once looked at its code. I then took record of the simple physics of what was happening throughout the game for every single event. This has been my planning stage for the bulk of the 'real' game itself (engine). 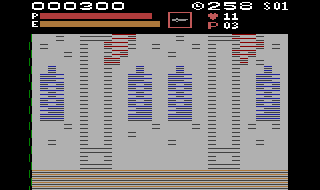 This is simply basing everything in the port upon all the doable (on atari 2600) characteristics of the original game encompassing every one of the 6 levels. And then I coded out what happens for every event that happens. Then it was just a matter of connecting the loose ends of every event as coded in asm to each ones trigger and each event in the game to where it should continue when it has finished. I logically deduced The maximum the engine could produce based upon the maximum that could be done in a possible kernel while conserving for resources of the system. This process has made it to where the port will have near, I'd say about 88% to 92% of the original game intact. No III tile and no scroll at all. Vertical scroll could change in the future but for simplicity's sake it will begin with full static imaging. Who would like to try out the first test bin? Extra special thanks to SeaGtGruff. This bin only renders out one game screen. It has not HUD code (yet) and no ame sprites or controls. It doesn't exactly refect the original PNG images i've posted but thats because there are only 19 addresses across 5 pages oout of 256 possible scanline data being used to create the screen. As you can see there are unavoidable color artifacts on the right hand side of the screen. This is a minor price to pay and IMO is easily overlooked. What do you guys think? More to come in time. I'm only posting the bin for feedback. As you can see there are unavoidable color artifacts on the right hand side of the screen. This is a minor price to pay and IMO is easily overlooked. I didn't even notice it at first glance until you pointed it out. Doesn't bother me any. It's nice to see a working example instead of just screenshots. Every .bin file will bring the full game closer to reality. Excellent! So far, so good. This project is very exciting. Great work. I agree that the artifacts are easily overlooked/ignored, and I told grafixbmp I didn't think anyone would mind. Then again, you know how 2600 gamers are... "What are those little black lines on the left side of the screen in Missile Command? Why couldn't Atari have gotten rid of them?" As I told grafixbmp, there *is* a way he can get rid of those artifacts if anyone complains too loudly about them, but it would mean shaving 1 pixel off the left side of the screen, and 2 pixels off the right side (but 1 of those is the "artifact" pixel anyway, so really only 1 pixel off the right). Then those pesky 2600 gamers would probably be asking "Why do the leftmost and rightmost columns of the screen have 1 less pixel than the other columns?" PS -- Even though grafixbmp gave me "extra special thanks," he really did everything himself. About all I did was change his overscan and vertical blank loops so they use the timer. Time for a minor/new update. 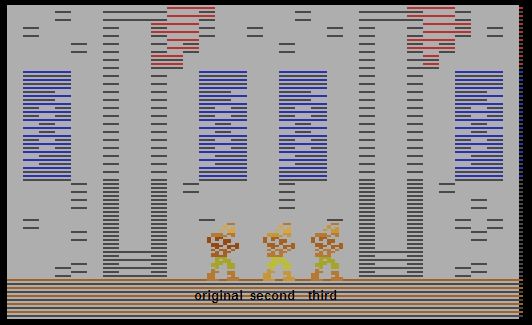 I have added player 0 sprite capabilities to the kernel and everything with it seems to be working just fine. There are no controls at the moment since i'm just doing display testing. Things are very much alive just very slow moving. Once the program is expanded out to 32k, ram won't be so constrained and other features can be added. Inquries about source code i'll respond on a case by case basis. I don't have access to an emulator at work. You might end up needing to make his colors a little brighter so he'll stand more against the background. I got some advice from a friend of mine and came up with this color scheme. It appears to be a bit more balanced over the whole sprite and may just work at a 30Hz as well as the normal 60 so an extra palette may not be needed. Stella won't let me compare them side by side without having a menu in the way, but from what I can see, he stood out more in your previous version. For example, his pants are so faded in the new version that they almost blend into the background. Are you running in emulation or an actual console? I created an image from emulator screen captures and placed all versions on simon side-by-side for comparison. For my eyes, I like the top half of the first guy, the pants of the second guy, and the boots of the first or third guy. Edited by Random Terrain, Sat Jun 18, 2011 6:22 PM.